I'm sitting pretty in microsuede living room heaven. For the fourth time in 11 years, the good guys over at Sumo have sent over an incredibly comfortable chair. This time it’s the microsuede Sumo Sway Single. What I’ve done to deserve all this good furniture is still a mystery to me, but my leading theory at the moment is that I was extremely benevolent in a previous life. All the karma that I banked is being repaid in sumptuously cozy chairs. Not a bad setup. Don’t worry, dear reader, I didn’t get dumped—this new piece of solo furniture isn’t an indication of anything going on in my personal life that I told Sumo about but not you. But regardless of your relationship status, the Sway Single will make you feel supported and loved. Like every bean bag chair, this thing will swallow you up faster than you can say, “Dang this bad boy’s soft as all hell.” Nothing better than to be enveloped in microsuede and realize that you don’t need to move your body ever again. Here’s a free tip to our future robot overlords: you don’t have to go full-on Matrix and put my body in a goo-filled tube. Just put me in a bean bag chair and you can harvest all the electrical power and fluids from me that you want. Hell, if I’m relaxed enough, I’ll plug those cables into my body myself. Unlike most bean bag chairs, the Sway features a pretty solid back with an articulated distinction between seat and back. Despite the obvious advantages in terms of comfort, bean bag chairs are typically just amorphous lumps. The Sway is a nice option if you need something more like a chair and less like a marshmallow; it’s a middle ground between a proper chair and a giant blob that you can curl up on. If you need a little more back support or prefer to sit up, but still want the comfort of lounging on/inside/among a giant pillow, the Single Sway is the chair for you. The Sway also won’t completely monopolize a space. 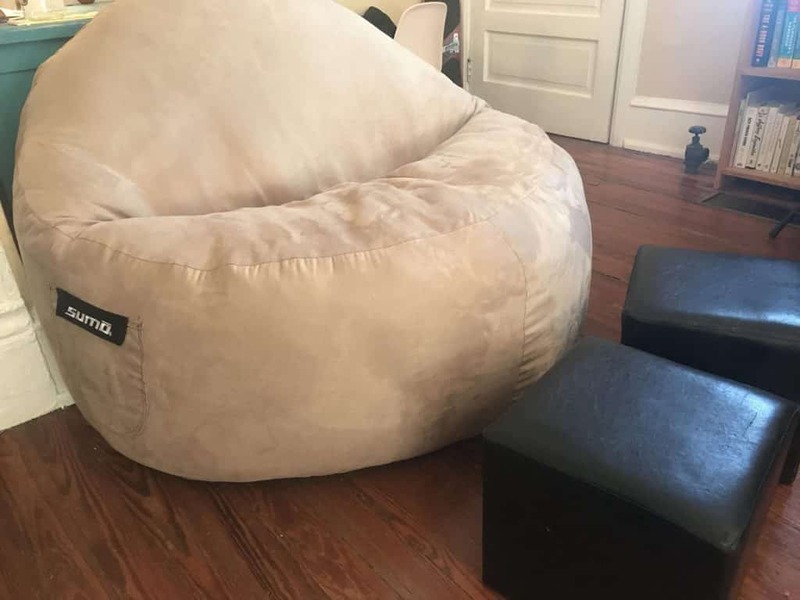 Don’t get it twisted: this is still a large chair, but it doesn’t flop down lethargically like a bean bag. The Sway sits up a little better in a room. It’s a bean bag chair that grew up a little and moved out of the basement, but still likes to have fun. It’s great if you’re afraid that a bean bag chair might make your room look like it was decorated by a stoner who solves mysteries with his dog—no shade to Shaggy, but dude has no interior design taste. The Sway is the perfect combination of “zoinks Scoobs!”-level comfort and sophisticated, Fred’s-orange-ascot vibes. Let’s talk fabrics, folks. This bad boy’s made out of microsuede, which is a pretty good fabric. If I was ranking fabrics, I’d say microsuede would be pretty high on my list. Suede is already pretty high up there, but this man-made alternative is just as soft and no animals have to give up their skin for it. I’d be hard pressed to name a better fabric. Flannel feels too 90's alt-rock and denim feels a too 90's pop for use on a chair. Real leather gets sticky and creaks like an old wooden staircase. Velvet seems nice, but is outside of my tax bracket. And velour feels out of the question; it’s the store-brand-cereal-in-a-plastic-bag version of velvet. Fleece? No. That’s going to make your bean bag chair look like Chris Christie’s torso. No one wants that. All I’m saying is that microsuede is a great fabric. And if you want to feel it cradling your naked body (hey, it’s your chair, I won’t judge), the Sumo Sway Single is a great way to get there.